created a new form for my website tonight.. added in the source code.. but it just shows a small white bar.. the form does not show up? 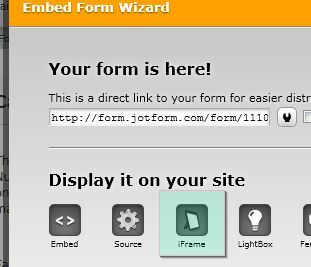 Can you remove embeded form and try using iFrame codes when embedding. Notify us of how this solution works for you. We'll await your response. Thank you. the only way i can get even the embed the iframe to work is if i set it to where a large form is on the page.. if the background was transparent that might work..
however.. it takes away from the aesthetic value of the design.. there was a reason I made the form on one line.. I want it to be thin at the bottom of the page..
if there is not an option to make the contact form thin on one line.. then jotform simply will not work. Could you please provide me the exact URL of your page, where you embedded the form's code? I want to check further the "live" code and determined what would be the issue. http://connect-me.com/ is the only page that this is dealing with..
To fixed this issue, first follow this article on how to make transparent background then remove your form source code in your website and re-embed your form code using iFrame. okay.. how do i make the form to be no more than like 100 pixels high? or is that possible? Just simply change the height of your iFrame code.